A fossil is the remains or traces of an organism that died long ago. Fossils of many kinds of organisms can be formed under a number of different conditions, as shown in Figure 15-5. Fossils show that different types of organisms appeared at different times and places on Earth. Some fossils are of organisms that have become extinct, meaning the species is no longer alive. Fossils are among the most powerful evidence of evolution. In 1669, Danish scientist Nicolaus Steno (1638-1686) proposed the principle of superposition. This principle states that if the rock strata at a location have not been disturbed, the lowest stratum was formed before the strata above it. Successive strata are newer, and the most recent stratum is on the top. Geologists in the 1700s and 1800s built on Steno's ideas by comparing strata in different places and by comparing the fossils found in different strata. The geologists began to put together a timeline for the order in which different groups of rocks and fossils were formed. This timeline is commonly known as the geologic time scale (a simple version of this table appears in the Appendix). Today, geologists often can tell a fossil's relative age—its age compared to that of other fossils—by referring to the geologic time scale and to records of known fossils. Erosion has exposed layer after layer of sedimentary rock in the Grand Canyon. Fossils trapped in the layers show that organisms changed over time as conditions on the surface changed over time. Deeper and older layers often contain fossils of organisms, such as trilobites, that no longer live on Earth. For certain rocks, scientists can estimate the time since formation, or the absolute age of the rock, by techniques such as radiometric dating. Scientists use both relative and absolute dating as they compare fossils around the world. In this way, scientists try to make their history of life on Earth as precise as possible. However, the fossil record is an incomplete history of life because not all organisms have left fossil evidence. Most fossils are formed only by rare events. For example, a fossil could form if an organism died in a place where it did not fully decay and where rock later formed over the remains. Then, if the fossil escapes destruction over time, humans will discover it only by chance. Nevertheless, Earth is rich with fossil evidence of organisms that lived in the past. A number of additional inferences can be made from the fossil record. First, we can infer that different organisms lived at different times. 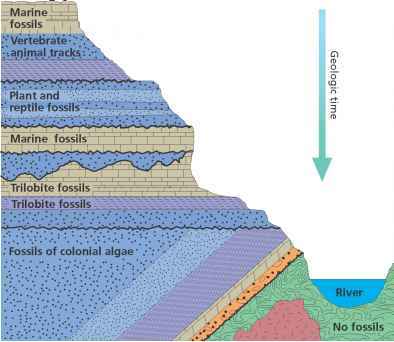 For example, the rock strata shown in Figure 15-6 hold different kinds of fossils in successive layers. Second, we can infer that today's organisms are different from those of the past. Trilobites, for example, were unlike any organism alive today. Third, we can infer that fossils found in adjacent layers are more like each other than to fossils found in deeper or higher layers. In other words, organisms that lived during closer time periods are more alike than organisms that lived in widely separated time periods. Different species of trilobites appear in nearby strata, whereas deeper and older strata do not hold trilobites but hold other kinds of organisms. Fourth, by comparing fossils and rocks from around the planet, we can infer when and where different organisms existed. Each fossil provides evidence about the environment in which the organism existed and for which the organism had become adapted. The fossil skeletons below form a sequence of transitional forms that support the hypothesis that whales evolved from four-legged, land-dwelling mammals. Scientists think that whales evolved from land-dwelling mammals. One of these ancestors may have belonged to the genus Pakicetus, which lived about 50 million years ago. The fossil skeleton of a pakicetid is shown here. Finally, we can infer from the fossil record that species have differed in a gradual sequence of forms over time. This inference is based on transitional species, which have features that are intermediate between those of hypothesized ancestors and later descendant species. For example, evolutionary scientists have hypothesized that modern marine mammals, such as whales, evolved from early mammals in the fossil record that walked with four legs on land. This hypothesis predicts that there should be fossils that share characteristics of both ancient land-dwelling mammals and modern whales. Indeed, scientists have found several fossils, such as those in Figure 15-7, that form a sequence of transitional forms. 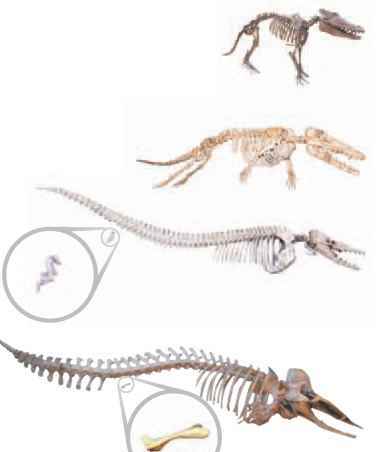 Comparing these fossils with each other and with modern whales reveals a sequence of differences in the structure of the hind limbs, fore-limbs, vertebrae, and skull of each species. Scientists explain these differences as increasing adaptations for life in water. For example, hind limbs were smaller in later species and are absent in modern whales except for tiny pelvic bones. The hypothesis of whale evolution from land mammals is strongly supported by these fossil finds. However, there are other groups of organisms for which fossils of hypothesized transitional species have not been found. This genus of mammal lived in coastal waters about 49 million years ago. It could swim by kicking its legs and using its tail for balance. It could also waddle on land with its short legs. This genus of mammal lived in the oceans about 40 million years ago. It resembled a giant dolphin and propelled itself with a massive tail. It had forelimbs that were flippers and tiny hind limbs that could not have been used for walking or swimming. Modern whales have forelimbs that are flippers. 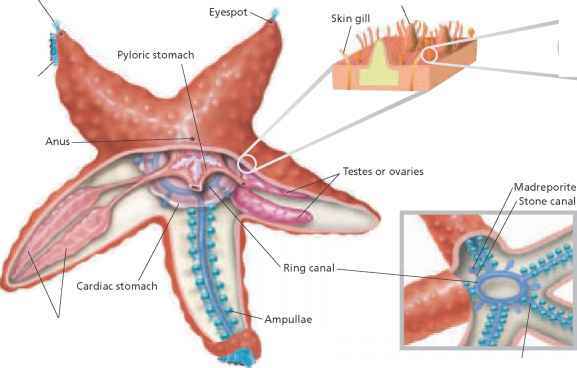 They also have tiny, nonfunctioning hip bones at the rear of their bodies.